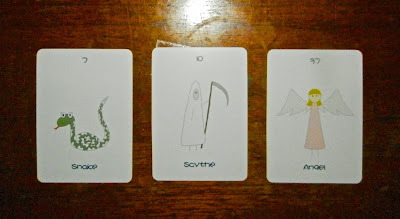 Today's Draw: Snake/Scythe/Angel from the Lovely Lenormand by Harpa Lúthersdóttir. Are you worried or anxious about something right now. Are you making decisions out of fear? Are you safe within the universe or, instead, do you live in a safe universe? The Lovely Lenormand is a really sweet little deck. It's very simply drawn and uncluttered. It contains four extra cards, plus alternate Man, Woman and Child cards. Harpa also offers a deck like my Deck of Lenormand Houses, but in Icelandic. Which is really cool for those who know the language. But anyway, this Lovely Lenormand is just that...lovely. And it comes with a cute little card that you can give to someone you think is lovely, which just adds to the sweet, gentle nature of this deck. I've decided to read this line of three in two different ways, which are related. The first is "fear is cut by spirit" and the second is "fear cuts away at spirit". I've replaced the traditional keywords for snake—danger, manipulation, deceit—with fear for today's reading, partly because it's what I want to talk about today and partly because these are the things we fear. Another interesting interpretation could be that a woman who cuts you down is really your angel. I like that because our nemesis is usually our greatest teacher. And often we'll get caught up in anger and hate for the person and miss the lesson. But when we crawl out of our victimhood and pain long enough to look at what she's mirroring back at us or what the lesson is, we can make great strides in our development. But back to what I wanted to talk about. I sometimes feel like I'm in a constant struggle with fear and anxiety. Like lately there's been a story about this knockout game where kids hit unsuspecting strangers upside the head to see if they can knock them out. And I was talking to mailman recently and he showed me a picture of a bit he got from a neighbor's pit bull...a huge chunk of flesh was gone from his knee and it took four months of rehabilitation to regain use of his hand. We have another such dog who often roams free in the neighborhood and has hurt other dogs, but not people. Then there's all sorts of other things compounding that. Someone on Facebook's neighbor's house exploded out of the blue. And things are slow at work right now. And I'm not in the best shape, what if I have a heart attack? Trust me, it goes on and on. I don't know if everyone is like this. But I have a tendency to overwhelm myself with anxiety. So this is something I've learned to control so that it doesn't control me. Which doesn't mean I don't still get all fearful now and again. But it no longer rules my life and my decisions. Years ago I had the question posed to me, "are you safe within the universe or do you live in a safe universe?" The first way is conditional, which is where I was at the time and still go sometimes. The second way is the way of "everything happens for a reason" and "everything is a gift". It's also the way of knowing spirit surrounds and embraces you, like the angel in today's card. When I look back on my life, it's true—nothing has happened in my life that didn't serve me in some way. The universe always has my back. When I remind myself of that, and when I sit in silence with spirit, I remember there is nothing to fear. We like to believe we're in control of our world and some of us go to great pains to set up a world that we can manage and control and keep in balance. And when we do that, we're operating out of fear. And in a world where we operate out of fear, all sense of control is an illusion, because fear is driving the bus. And fear puts distance between us and the source, essentially pushing source away because we can't trust it has our back. In a world where we operate out of love and trust, however, we have a kind of control in the sense that we remain pliable to all the slings and arrows that come at us. So we can weave and bob with life. While I believe we can manifest anything we want in life, we have no influence over where, when and how that manifestation will occur. There is a greater hand moving the pieces around and that hand holds nothing but love. The more I remember that on my path, the easier I move along it. So very well said and so very true. I mostly live in fear/anxiety except for those moments when I don't. They are amazing and the reason to keep going. Thanks for sharing this. Hi Tierney, thank you for writing this. It is so recognizable. I am glad to say it gets better over time, but anxiety can still be like that snake; it wraps around me and can be suffocating.